Kuon. It is a Japanese word for “eternity”. It is also the name of a rather obscure PlayStation 2 game developed by From Software and released in North America by Agetec all the way back in 2004. 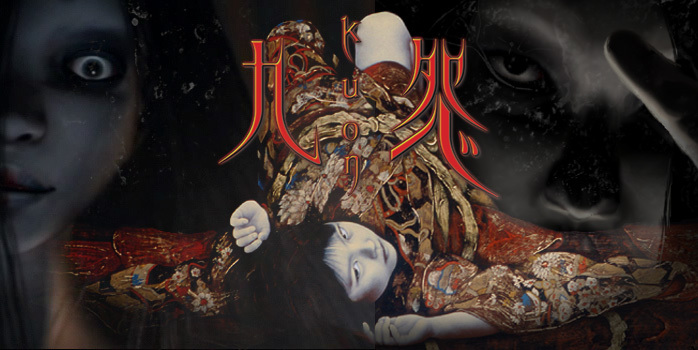 Kuon is a survival horror title created during what one might argue was the heyday of the genre. The age of Silent Hill 2 and 3, Fatal Frame and Fatal Frame II, and the GameCube Resident Evil remake. Though I had heard of the game at the time of its release, I never actually played it, but my curiosity remained. That curiosity had only grown stronger over the years since, and the Internet has done little to sate it. Performing a Google search for “Kuon” today brings up very little. Beyond the official Agetec site, which is remarkably still up and running after nearly eight years, a sparse Wikipedia page, and the requisite Youtube and Google Image links, there doesn’t seem to be much in the way of actual text on the game in any form. While Youtube could certainly come to the rescue in a case like this, I felt it would be better to finally give the game a try myself. Earlier this year, I found a copy for sale on Amazon and bought it with the intent to save until the month of October. Since the time has come, I cracked the case open, slid the disc in my PS2, and began to explore. And though I still have much left to play as of the time of this writing, what I have found thus far has turned out to be a rather fascinating history lesson. It had been many years since I had last played a survival horror game of this type, but as I set about learning the controls and how to play, a great deal began to feel very familiar. Thankfully, it doesn’t go too far back; the tank controls of Resident Evil are absent, but other genre hallmarks of the era remain, such as the fixed camera angles that shift as the player moves from room to room and the heavy focus on inventory management. 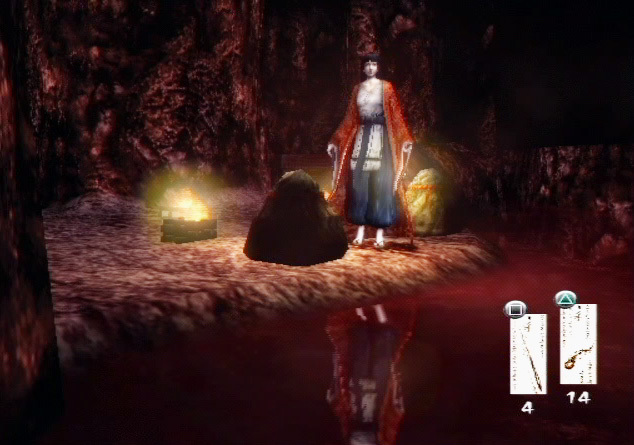 Kuon even features the requirement of using an expendable item to access save points. This save point won’t do you much good without a vessel to set in the water. That IS water, right? To one degree or another, each of these design choices have disappeared over the intervening years. One might think that suddenly jumping into a game that features all of them at once would be falling into an antiquated trap, but to be honest, it’s really not so terrible to experience them again. It’s almost refreshing actually to play a game that utilizes these mechanics after so many years of developers looking for ways to eschew the old for the new. This has not always turned out for the best. So in that sense, I appreciate the game mechanics for what they are, regardless of how outdated they may be. Kuon is very much a product of its time, but in those regards, it holds up rather well. The main knock I really have against it in terms of its gameplay, at least so far as I’ve experienced in the few hours I’ve played, is the presence of an optional door lock puzzle. Operating like one part combination lock, one part Chinese Zodiac, the Japanese characters inscribed on it don’t make it particularly accommodating for English speakers. (Strangely, the FAQ I attempted consulting was of no help either, as the author seems to be under the impression that it’s a different puzzle entirely.) However, its optional nature lessens the pain at least somewhat. It is, perhaps, one part of the game where Youtube could legitimately come to the rescue. It’s not solely the gameplay that attracted me to Kuon, however. In fact, I barely understood what the gameplay was like before diving in head-first. No, what truly attracted me to the game was the subject matter. Unlike most horror games of its type, set in a modern or near-modern world, Kuon is a period piece set during the Heian era of Japan; an era that precedes the more popular view of feudal Japan’s Sengoku period by hundreds of years. Unlike the historical era that inspired such games as Onimusha, Samurai Warriors, and Nobunaga’s Ambition, the Heian era was one of relative peace; one in which mystics called onmyouji were employed and performed tasks ranging from astrology to exorcism. In Kuon, the player takes the role of one of two young women; Utsuki, described as the Yin, and Sakuya, the Yang. Utsuki is the daughter of Doman, an onmyouji of poor standing, whereas Sakuya is one of Doman’s apprentices. 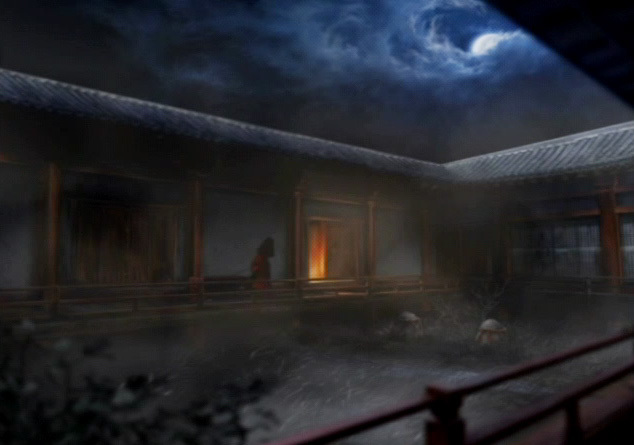 Separately, each of the girls come to Lord Fujiwara’s manor, which has become overrun with ghosts and demons. Utsuki wishes to find her father, while Sakuya is there to perform her job and prove herself. No matter which character the player chooses, however, the point of view eventually shifts to that of Abe no Seimei, a historical figure who in real life was a highly regarded onmyouji. It is this focus on the onmyouji’s mystic powers that provides the central gameplay conceit, and that separates it from other games of its type. The player’s primary weapons are paper talismans that represent different spells. Some are used for direct projectile attacks, while others summon creatures such as spiders to aid the player. Should the player run out of talismans, a standard weapon may be used instead, though in this case, “standard” means something such as a paper folding fan. The mystic arts are your friend. When the player character has taken too much damage, they enter a state of vertigo that causes the screen to blur, signifying that death is imminent. During this time, use of talismans becomes impossible. The only options are to either use the standard weapon as a last line of defense or attempt to flee. Like other survival horror titles of the era, healing items can be found and consumed at any time to alleviate this status when things are dire, but what I find more interesting is another option; meditation. Meditation, in this case, allows the character to restore status and health to full by standing still and performing a chant. This is done simply by holding a shoulder button on the controller and can be done at any time without penalty. In a way, it reminds me of the concentration mechanic used in Metroid: Other M. It’s supremely useful, but is only safe to invoke when enemies aren’t an immediate threat. Beyond these mechanics, there’s also the way that the game looks and sounds. The manor that serves as the game’s setting does much to evoke the manner of architecture and dress of the era. Those that have studied the period or its literature will readily recognize these aspects, from the style of kimonos worn by characters to the décor of the Fujiwara estate. And all of it is drenched in an atmosphere of blood, death, and darkness, with bloody footprints and trails lining the halls, crazed messages scrawled on the walls, and the corpses of the unfortunate scattered about in all corners. The audio is also perfectly suited to the atmosphere desired, from the creepy children’s song sung on the title screen to the sound of wood planks creaking under the weight of footsteps. It helps that the game includes the Japanese audio for the more authentic feel, though the dialogue, as far as my limited understanding of Japanese goes, is much more modern than the historical dialect. The art and aural direction do much to evoke the era of the game’s setting. So with all of this in mind, I guess it’s time to answer the most important question regarding Kuon. Is it scary? As far as I’ve played, I wouldn’t call it such. Part of that is obviously due to the game’s age. Its PS2-era graphics don’t really hurt it, but at the same time, they might have been more effective had I played the game upon its release. However, it has gotten me on a few jump scares. 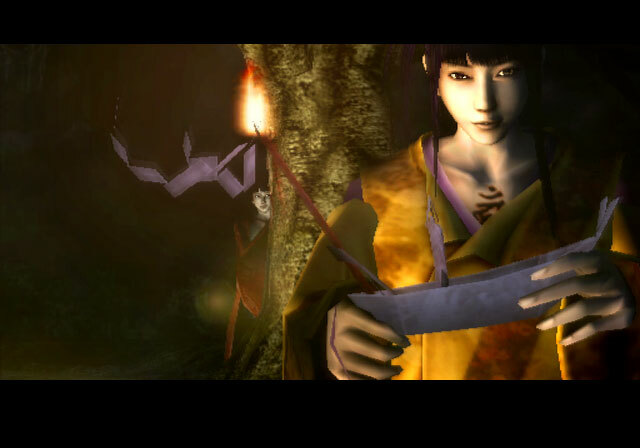 But while I haven’t felt the sort of sheer terror and dread that came from my time with the Fatal Frame series (no other game has left me nearly as shaken), it’s still an entertaining ghost story, as far into it as I’ve played. The period feel and the reliance on spiritualism and ghosts paired with with the undead is a fine mixture, and it’s for this reason that I feel inclined to continue playing, more than the masochistic desire to be left hiding under my bed covers in a quivering mess. It appeals to the old side of me that spent hours in Japanese Literature class back in college pouring over The Tale of Genji coupled with my fondness for films like Ringu and Ju-On. Too much time has passed for me to fairly say how Kuon compares to its contemporaries in the survival horror subgenre. Nor can I state how the game is over all, as there’s much I have yet to experience. What I can say, however, is that the game has proven to be a most intriguing history lesson, both in terms of its mechanics and its thematic components. It’s a trek into a moment in time and culture rarely covered in games that see a western release; one that I’d like to see more titles explore. For that reason alone, I’d recommend those interested give it their own examination. For everyone else, it’s a return to past game design. Kuon is outdated in some ways, perhaps, but in the world of Silent Hill: Downpour and Resident Evil 6, it feels refreshing all the same. I hope you’ve enjoyed reading! I’m off to play some more. All images in this article are taken from Agetec’s official site, with thanks.